Home » Giant Thoughts » Get Your Free Second Saturdays Passes for March Now! The League and our park partners will be planning guided hikes and other interpretive programs for the free days. On our second Free Redwoods Day in February, Rolando Coden, our Chief Operating Officer, and Harry Pollack, our General Counsel, led a small group of hikers through Portola Redwoods State Park. Along the trail, the small group of nine frequently stopped to marvel at mushrooms, fairy rings, whorled redwood bark and goosepens—all the strange, wonderful features of the redwood forest. On March 10, you can join a Park Interpretive Specialist for the “What’s the Point” walking tour of Patrick’s Point State Park highlighting the great variety of recreational, educational, and inspirational opportunities available to visitors. You can also volunteer to remove English ivy at Patrick’s Point State Park. We’re nine people, trekking through Portola Redwoods State Park on a sunny Saturday afternoon led by Rolando Cohen and Harry Pollack from Save the Redwoods League. 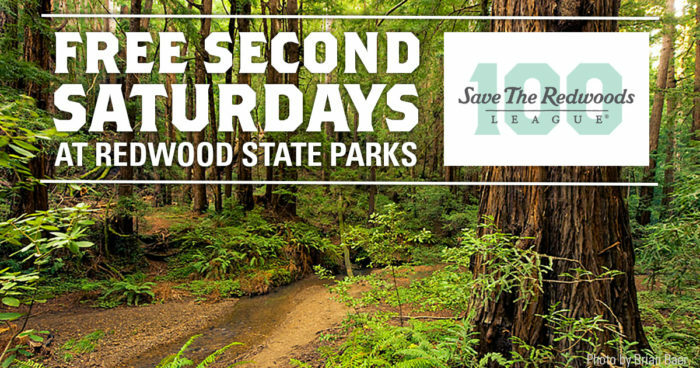 Our hike was a component of the League’s Free Redwoods Days, which will happen every second Saturday of 2018.